Industry: The Food Must Go Out is an ode to the restaurant industry and all the actors who spend their second lives there. Sometimes life imitates art and vice versa in a serendipitous feedback loop. Pippa Mackie is an actor, and she also works in a restaurant; not the other way around. The line between these two parallel lives is becoming a bit blurred lately as she performs her new show, Industry: The Food Must Go Out, at the Vancouver Fringe Festival. “The vibe is a chef, a busser, and a server walk into their own restaurant, it’s closed down, and they want to have some fun — that’s really what the show is,” said Mackie. The show is performed at Edible Canada on Granville Island, the hub of the Fringe Festival, and the circumstances couldn’t have been more perfect for this show. 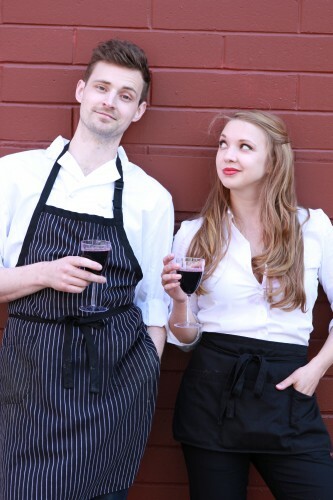 Mackie works with chef Nik Bunting, a sketch comedian, and server Lauren Jackson, who is a fellow theatre school grad. Mackie has had an idea brewing for a while to do a show involving life in the restaurant industry, but a couple of months ago it all started to come together when she thought about doing a show at her workplace. “It’s worked out extremely well, and it’s really a dream because I have had this idea for a while. To do it in an actual restaurant once it’s closed is amazing.” Their manager, doubling as executive producer of the show, was very supportive of the idea, and the three of them began working at the restaurant by day and rehearsing there by night. “We’re up until 4:00 a.m. rehearsing. I can party until 4:00 a.m. just fine, but being genuinely creative at 4:00 a.m. is really, really insane,” laughed Mackie. With their combined 30 years of restaurant experience, Mackie, Bunting, and Jackson have a huge collection of stories to draw from, and now that she’s writing a show about working in the industry, Mackie said she is constantly coming across new material. “When you’re writing a show you start really hearing things. If we could make the show three hours, we would.” The show is just under an hour, and they have tried to cover all aspects of working in a restaurant. There are a few things that acting and serving in a restaurant have in common. “There’s something really dramatic about working in a restaurant,” said Mackie, “it is like being on stage, once you start serving a table you have to finish it. You do have to have a personality that can address a group of people and be confident in that, so I think it does require a certain amount of confidence.” Although they don’t have to memorize lines, they do have to memorize orders, and timing is everything. The show’s timing between different scenes was just right. “We kind of have these fantasy moments. Like a different interpretation of what a brunch shift feels like,” said Mackie. Their interpretation of brunch is the kitchen as the trenches where the cooks stay as the servers go out on the front line into the battlefield. It’s a war zone and sometimes they lose people or tragically cook someone’s eggs wrong. These fantasy moments were a very nice balance to the more personal monologues and segments of audience participation. “We have a blind tasting during our show and one lucky audience member will be chosen,” said Mackie. “We’ve given ourselves all these tasks during the show, things that are kind of risky. I think that’s what this business is about — both the performance business and the restaurant business — is that they’re both risky in different ways.” Whereas a chef will risk serving a new dish, they’re taking risks with audience participation. “We don’t know what they’re going to say, and we don’t know what we’re going to say back to them. We know the activity they might have to do, but we really don’t know where it will take us.” It’s all in the spirit of the festival, and Fringe is a great place to experiment and interact with the audience. “The Fringe Festival crowd are some of the best audience members you could ever ask for — they’re very engaged, they’re very excited,” said Mackie. Watching the opening night performance, I think the audience loved the interactive aspect of the show, and they also loved being able to hold up their pre-paid colour coded piece of paper and have a drink brought to them. It’s a casual atmosphere and the show is so engaging and funny that you may even forget to use that drink card. While this show is for anyone who’s ever worked in the restaurant industry, it’s also for the general public who may learn a thing or two about how to be a good customer and how to ensure the staff won’t make fun of you in the back. One quick tip: don’t pronounce the wine wrong. If you don’t know, just don’t say it. Another thing that makes it into the show is the hated hot water with lemon order. This is a sure fire way to get on a server’s bad side, along with showing up a few minutes before closing. “It’s an ode to what we do, and so much of it we’re hoping to be relatable for people who work in the industry. I’m really interested to see which jokes get which laughs because we have so many that are catered to the industry,” said Pippa. While I’ve never worked in a restaurant, I found this show at times hilarious, poignant, and artfully structured in a way that there was never a dull moment.